In March of 2016, the College Board implemented the administration of the new SAT. 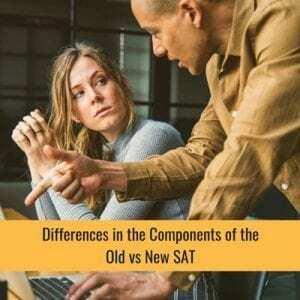 What’s the new vs old SAT test? How was the new SAT revised from its old counterpart? It has been quite some time when its creating body has stirred things up for the SAT, considering that its last revision took place in 2005. As a college-readiness assessment test, the new SAT is more closely aligned with the Common Core State Standards and is much more similar to the ACT. Here is a comparison between the old SAT and the new SAT. What Are The Important Features Of Each Test? Time limit. 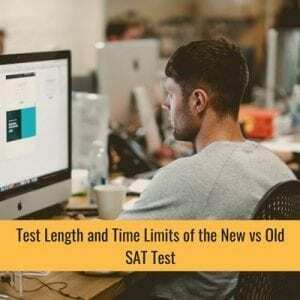 The old version of the SAT took 3 hours and 45 minutes to finish, whereas for the new test, it lasts 3 hours, but if you take the optional Essay test, you will have an additional time of 50 minutes to accomplish it. Subjects. There were 4 components in the earlier test, and they are Critical Reading, Writing, Mathematics, and Essay. If you take the current SAT test, you will encounter the topics of Evidence-Based Reading and Writing with the sub-topics of the Reading test and the Writing and Language test. The two other main topics in the new test are Math and the optional Essay test. The old SAT emphasized the general reasoning aptitude of test-takers, whereas the current SAT focuses on the knowledge, skills, and understanding of students, which research has cited as most significant for their college and career readiness and success. The 2005 SAT accentuated vocabulary that was often found in a limited context while the 2016 test highlights the meaning of particular words as featured in extended contexts. It stresses the way word choices signified the meaning of words together with its tone and impact. The scoring of the old test was quite complex wherein a point was given for a correct answer and every incorrect answer has an equivalent deducted point. If a student leaves an item blank, it will not impact their score. The scoring of the new test is only about giving a point for every right answer with no penalty for wrong answers. 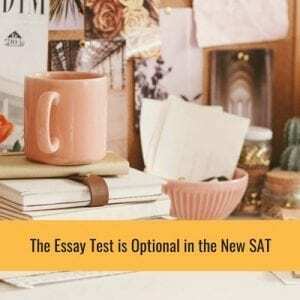 The Essay test was given at the beginning of the old SAT, while in the new SAT, this test became optional and is administered at the end of the exam. It now depends on particular colleges or universities if they require their applicants to have an Essay score. The previous test allocated 25 minutes to compose an essay while the current SAT imposes a 50-minute time limit for this test. The old SAT aimed to test the writing skills of students where they were required to take a specific position about a presented issue. Meanwhile, the new SAT tests not only the writing skills of learners but also their reading and analytical abilities. The Essay test in the new SAT requires test-takers to accomplish a written analysis based on a given source text. The score reporting of the old and new SAT predominantly differs as well. The former SAT imposed a score ranging from 600 to 2400 points but the current test implemented a 400 to 1600 score range. For the Critical Reading topic, the old SAT scaled the scoring from 200 to 800 points; Mathematics 200 to 800 points and Writing for 200 to 800 points. There was no subscore reporting in the old SAT. What about the scoring of the 2016 SAT? That’s 200 to 800 points for Evidence-Based Reading and Writing; 200 to 800 points for Math; and 2 to 8 points for every one of the three dimensions of the Essay test. Subscores are imposed for every topic in the new SAT, and they tend to give more insight about the test-takers’ skills and know-how to the students themselves as well as their parents, educators, admissions officers and school counselors. How does the test length of the new SAT vs old SAT compare? The Critical Reading component of the old test was comprised of 67 questions with a time limit of 70 minutes. This previous test’s Writing topic had 49 questions that had to be accomplished in 60 minutes. There is 1 required essay in this test that had a time allocation of 25 minutes and its Math section had 54 questions with a 70-minute time limit. Overall, the 2005 SAT had a total of 171 test questions that students had to finish answering in 225 minutes. The Reading section has 52 questions with a time limit of 65 minutes. The Writing and Language test is composed of 44 questions that have to be done in 35 minutes. The optional Essay test requires students to write 1 essay in 50 minutes. The Math topic has 58 test items that have to be completed in 80 minutes. To sum up, the new SAT totals to 180 minutes in length, or 230 minutes with the Essay test and a 154-items test questions or 155 with the Essay test. SAT vs ACT, Which One Should You Take?